Quickly! Name two female indulgences. 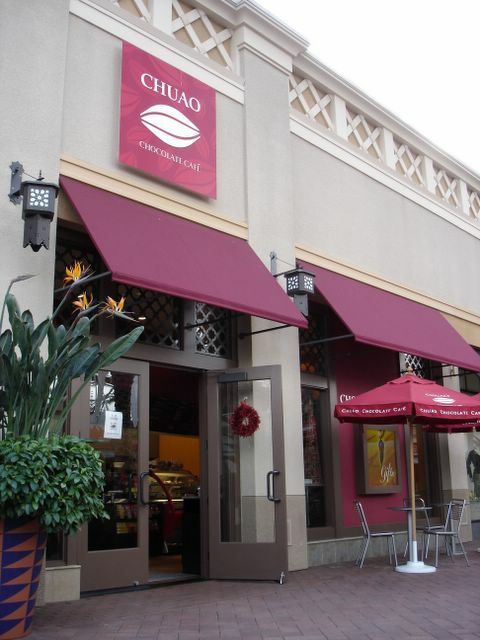 If you said "chocolate" and "shopping," then you are thinking the way the owners of Chuao Chocolatier must have been thinking when they scouted the location of their store. It's situated smack dab between the two retail anchors of the Irvine Spectrum Center; Robinsons May and Nordstrom. I don't know for a fact if this was truly a strategic decision or just a happy accident. But it sure smells like part of a carefully calculated plan to cleverly tap into female psyche, mining the fondness of the cocoa bean and fashion. Perhaps I'm doling out too much credit where it is not due, but I can't help but think that some forethought was involved. This is Irvine after all, where the placement of every shrub on every corner goes through a vote by committee. Hey Ashley, Nordstrom's out of stock of the Jimmy Choos I wanted. I'm, like, so bummed! Let's check out Robinsons May across the way. Wait a minute...let's stop in here to get a chocolate bon-bon first. Oh Mary-Kate, Robinson's May didn't have my size in Levis. Let's walk to Nordstrom. Hmm, I feel like a flourless chocolate cake. I am making this up. I don't know if those Olsen twins even eat. (And I'm told that it's unlikely that they'd wear Levis or step foot into "Rob May"). And also, I wouldn't know if they sell Jimmy Choos at Nordstrom. As a guy, I don't know these things. Really, you should just be amazed that I even know what Jimmy Choos are. But the truth is, I know as much about chocolate as much as I do about shoes, fashion, and the Olsen twins. And eventhough I can probably tell the difference between a Hershey's and a Scharffen Berger, I consider myself a chocolate idiot. So I'm not going to pretend that I know the flavor profile of Venezuelan chocolate and how it compares to those made from Ivory Coast cocoa beans. 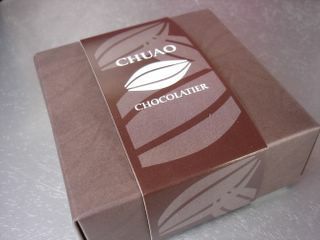 But apparently, the folks at Chuao do know the difference, because they make it a point to note that all of their chocolate comes from Venezuela and that, in fact, their name is taken from the region where the beans are cultivated. It's evident that they are intensely proud of this. MODENA: Dark Venezuelan chocolate bon-bon filled with a soft caramel deglazed with strawberry pulp and balsamic vinegar from Modena. CARDAMOM: Soft cream ganache scented with fresh cardamom covered with Venezuelan dark chocolate. Each piece is placed on a pedestal. Literally. Albeit teeny-tiny ones, made from brushed metal, inside the long glass display case. I bought a sample box of nine chocolates, which they called a "Tease," and found them decadent, creative, complex, and not sugar-ladened. The depths of flavor from the chocolate comes through clearly, even when it is paired with unconventional and sometimes odd ingredients like balsamic vinegar or cardamom. The former, by the way, was probably my favorite out of the nine, with the oozing syrup of tart balsamic vinegar and strawberry bleeding out as soon as I took a bite. The Cardamom tasted vaguely of Indian curry, which is as close to "Bertie Bott's Every Flavor Beans" as we'll ever come. But how much of the credit is attributable to the Venezuelan origin of the cocoa beans is still unclear to me. My kudos goes to the inventiveness and artisanal method of preparation more than anything else. But what does this idiot know? Regardless of where the cocoa beans came from, I thought these were damn good chocolates. Good but unapologetically expensive too. 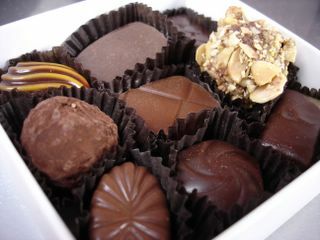 This handsome box with nine small chocolates was $15.00. Too many of these and not even Mary-Kate and Ashley will be to afford their couture. Hey Elmo - Quite funny!!! I was sending out Chuao Chocolates, because they were pretty unique to the San Diego area. sigh....I guess I need to find something else to send out now. BTW, do they offer the chocolate making classes at that location as well? Ahh the forward progress of commerce! Although it's no longer just a San Diego treat, I'm pretty sure they don't do the chocolate making classes at the Irvine store. It's actually quite small, with barely any room to do anything other than buy your chocolates, pastries, hot cocoa and then leave to do more shopping. mary kate and ashley olsen wouldnt be caught dead wearing levis nor shopping at a Rob May. Change the jeans to "true religion," "citizens of humanity," or "Juicy couture." But yes, pretty impressive that for a guy, you know about jimmy choos. :-) though i marvel at your culinary expertise and taste, u could learn a thing or two about fashion. I'll need to check this place out. I find that each year, i like chocolate even more! you shoulda asked me about what the olsens wear. after all i worked for them for a year. oh well, next time. p.s. they love henry's tacos and cpk. but i'm sure their foodie tastes have become much more sophisticated since relocating to manhattan and going to nyu. You might as well be speaking Greek to me now! ;-) Those are the names of jeans? Whodathunk? I would have guessed they were political action groups. HAHA! I think I have a lot more to learn about fashion than just a thing or two...By the way, I worked in your comment about the twins in my post so that I don't sound like the complete ignoramus that I actually am. That's funny! Well, at least it wasn't a scatter plot that looks like a spider! You know what? I remembered reading that you worked with the Olsens, but couldn't remember in what capacity. I do remember something about oxtails in that same post...I think that's saying something about my selective memory. I gotta re-read that post again. I'm curious, do they wear Levis and shop at Robinsons May? Oh I soooo agree with Cathy that they wouldn't be caught dead shopping at Rob-May. Although... since Rob-May is about, uh, 5 yrs behind the times in fashion (which is prolly why they're being bought out by Federated) AND that the Olsen twins ARE washed up 80's celebs, maybe it wouldn't surprise me after all. Oh, and I can attest to the fact that they love CPK...I've seen them before at the Studio City CPK, another hangout for washed up 80's celebs! Nice write-up as always. I really think Chuao is a nice change of pace from the usual offerings. HA! Spoken like a true Chowhound! Thanks for the vote of confidence and the sanity check! I wondered if anyone noticed that when I posted this review on Chowhound I left out the references to the Olsens...I think I saved a few posters from the Chowhound moderator's delete key, had they commented on the "Not About Food" talk. Whoa! Chocolate that tastes like Indian curry sounds intense! I have to say though, I am pretty finicky when it comes to chocolates--I won't eat the ones with orange gelatin or peanut butter. It doesn't sound like you are "one of those" who eats a bite and puts it back in the box if you don't like it. Also, it may be harder to tell the difference between Hershey's chocolates and Scharffen Berger: the Berkeley-based chocolatier has been acquired by the gigantic Hershey's Corporation. You got me pegged. I'll try anything once. Actually I recently tried those Bailey's Irish Cream filled chocolates from Trader Joe's. The gush of stinging alcohol put me off at first, but after the first one, I was addicted. A shame about Scharffen Berger...I had forgotten about that. Hope the quality remains the same. I heard that Hershey's itself doesn't taste the way it used to. The guy in the store is a rude jerk. Colombian friends say that Venezuelans are arrogant and he confirmed it. I am never walking into this store again. I would rather choke on a hershey's peanut butter chocolate (ewwww). Hey Elmo- I WORK AT CHUAO!!! Come visit us again...i loved ur write-up about us...but u should come back and try our FIRECRACKER. I guarantee it'll be ur new favorite flavor; its everybody else's. One of my favorite places, my folks live close to the store and everytime that I go and visit them I buy chocolates.